Among companion animals, boxers are unmatched in their devotion, loyalty and friendship to humankind. Anyone who has ever loved a bxer can attest to its hundred-fold return. The excitement your boxer shows when you come home, the wagging tail at the sound of the leash being taken from its hook, the delight in the tossing of a tennis ball, and the head nestled in your lap-those are only some of the rewards of being a boxer owner. Owning a boxer is not just a privilege, it's a responsibility. These animals depend on us for, at minimum, food and shelter, and deserve much more. If you are considering taking a boxer into your life, you need to think seriously about the commitment that boxer ownership entails. If you already have a boxer, you need to consider if you are fulfilling all your obligations as its owner. The ABC Breeder Referral is provided as a courtesy to potential buyers. The ABC does not recommend, guarantee, endorse, nor rate breeders, their kennels, or their stock. We also do not examine individual dogs. Buyers beware in all instances. 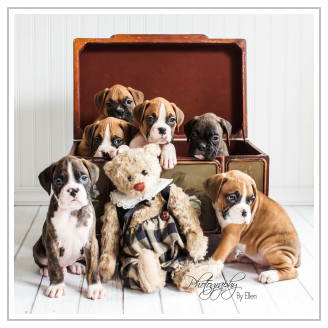 Buyers should be certain to check all matters relating to registration, health claims, awards or certificates, Boxer quality (adult, puppy or otherwise), stud/puppy agreements with the breeders, sellers or stud owners before making any decision. To find a responsible breeder, go to a dog show or visit the breed's Parent Club for additional resources and contact information. Don't leave the premises without the appropriate documentation of the dog's pedigree, a.k.a. "papers". The words "American Kennel Club" as well as the AKC logo should be clearly visible. You'll need to send in this application form to register your dog with the AKC. Be wary of a breeder who refuses/hesitates to give you papers, wants to charge you more for AKC papers, offers papers from a registry other than the AKC, or tells you he/she will mail them to you at a later date.